Martyn Collins Digital and Social Media Marketing Services: Shop Local West Kirby - who sells the best Eccles cakes in town? 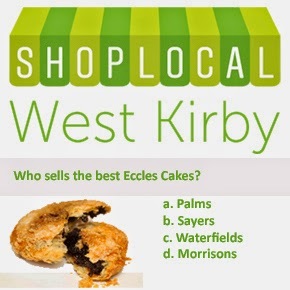 Shop Local West Kirby - who sells the best Eccles cakes in town? We've been working with local retailers in West Kirby on the Wirral to raise awareness of the strength, quality and variety of independent shops in the town. It's called quite simply Shop Local West Kirby. Simple things can sometimes capture the imagination and create engagement better than other supposedly more sophisticated forms of marketing. For instance an online debate in Facebook has started on which shop sells the best Eccles cakes in town. This prompted over 100 shares and many more comments and got many people not only talking and joking about Eccles cakes but also significantly improved the brand awareness of Shop Local West Kirby.